When conducting research to complete written assignments, students tend to find their information non-sequentially. It is when attempting to organize and present their material in a logical order that many falter. MatchWare's MindView is a Writing Skills software tool that allows students to use Mind Mapping techniques to brainstorm and visualize their ideas, organize their information sequentially, export their Mind Maps to Word to create effective linear outlines, and use those outlines to write clear, articulate texts. 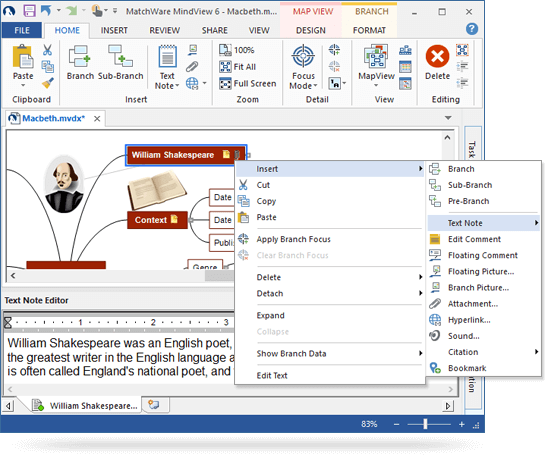 MindView is an invaluable writing skills software tool that allows students to plan their research, brainstorm their ideas, and visualize their information in 5 interchangeable views: Mind Map, top-down, left/right, outline and timeline. Try Our Research Paper Software Free! By displaying their information graphically, MindView's writing skills software functions enable students to quickly determine when organizing topics which ideas require illustration or elaboration. MindView helps users to visualize relationships using main branches, sub branches, colors and branch connections. Since research is typically done in a non-sequential method, users can group like topics as they come across them. Using colors and branch connections assists users to overview related topics and helps with memory retention and recall. 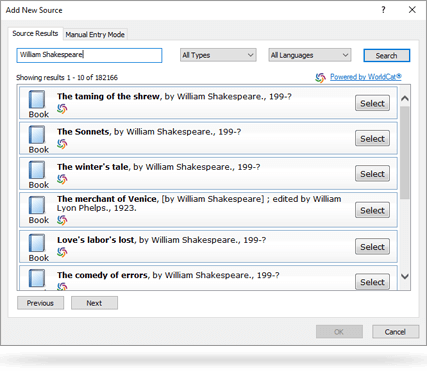 MindView makes it easy to add notes using the built-in Note Card function, attach relevant files, and add hyperlinks to expand on topics and cite sources. MindView makes it easy to take notes using the built-in Note Card, attach relevant files, and add hyperlinks to expand on topics. When writing a research paper, each topic will have supporting information, and MindView helps users to detail a topic by creating multiple text notes which are automatically attached to the respective branch. The branch attachment and hyperlink features allow users to include additional supporting files and websites, which are also attached automatically to the branch. Users can go back to each branch and view notes, attachments and hyperlinks by hovering the paperclip icon. When learning how to write a research paper, you are introduced to the pain staking process of managing multiple sources and creating citations for your research. MindView has partnered with WorldCat.org, giving users access to more than 1.6 billion documented sources. As users come across a useful source, they can quickly add it to the MindView file. As required, users can then call on those sources and easily create citations with a few mouse clicks. Since MindView is linked directly to WorldCat, all of the necessary information will be captured and included in the MindView file. MindView also formats the citation to the desired citation style automatically. The process of capturing non-sequential information and formatting it into a linear document is one of the most difficult parts of learning how to write a research paper. 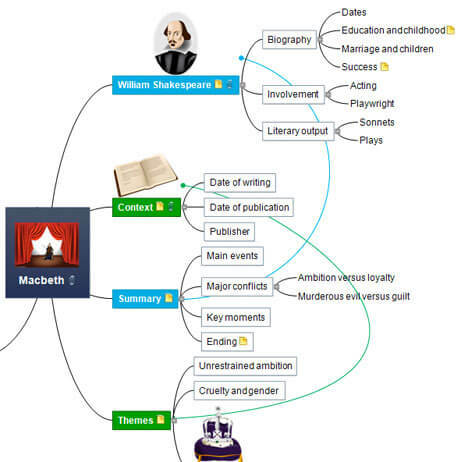 We have discussed the many ways that mind mapping assists in the research process. 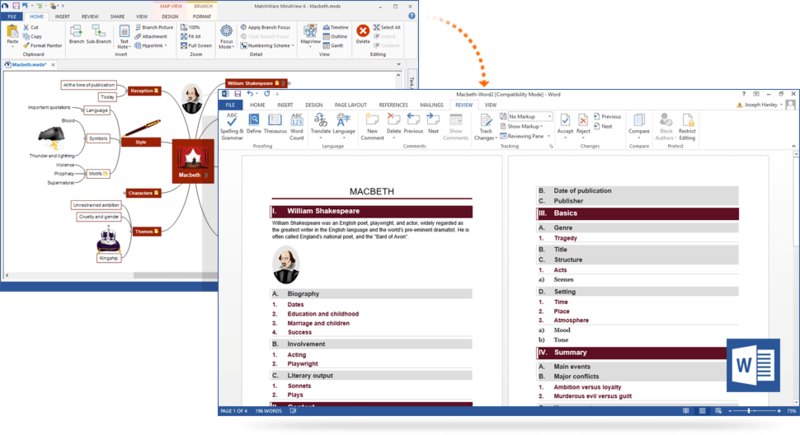 MindView takes this a step further by allowing a one-click export to MS Word, where the process of writing the research paper is handled automatically. Choose from professional templates including APA, MLA, Chicago, Harvard and more. Include title pages as well as reference and works cited pages with a simple check box. MindView not only transfers your research into a professional linear document, it also ensures that the headings, font and citations are all correctly formatted based on your choses export template.